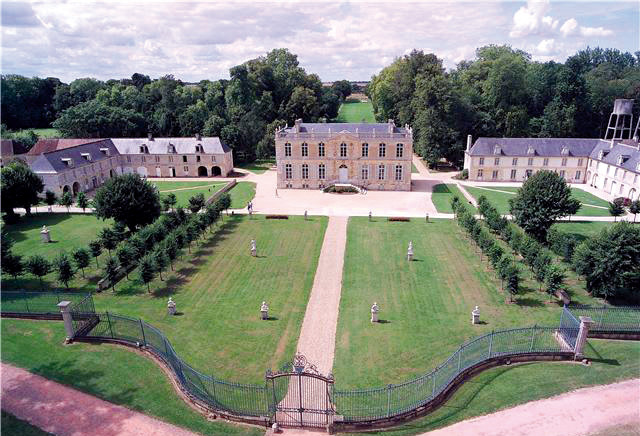 Around the chateau the French style garden with its ordered structure enhances the classical architecture. Grand symmetrical paths, geometrical flowerbeds, mirror of water giving a perfect reflection of the house and everywhere are finely groomed vistas where balance reigns. 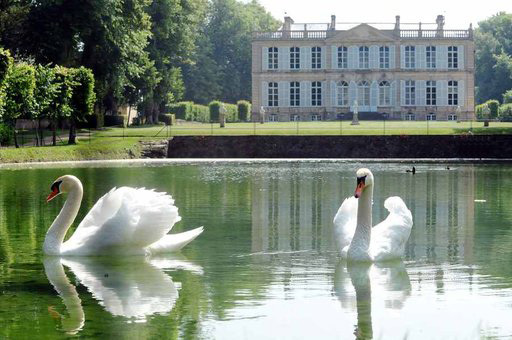 Constructed at the same time as the chateau, the ornamental lake provides a perfect reflection of the façade. The ‘mirror’ is fed exclusively from spring water at a constant temperature of about 13°. Trout, carp, roach, and eels are as comfortable there as the swans and ducks. Finely sculpted statues on plinths in Carrara marble adorn the whole scene. Lower down in semicircular formation flows the river Laizon, which has its source close to Falaise. Constructed in perfect symmetry on each side of the chateau, Canon’s outbuildings are arranged around closed interior courtyards. While the buildings on the south side housed resources for the chateau, of which the cider press and orangery are still in situ, the farm on the north side was reserved for the festival of the good people, which took place in the great ‘Salle des Rosières’, now restored.